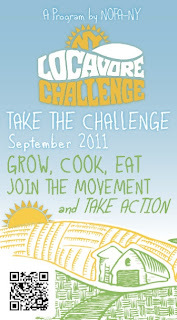 I'm gearing up for the 2nd annual New York Locavore Challenge -- it starts on September 1st and is a month-long campaign. Will you join me? It's easy to register, and it's free. 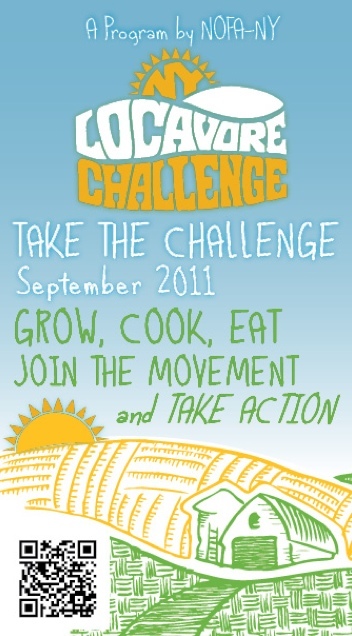 The Locavore Challenge is sponsored by the Northeast Organic Farming Association of New York (NOFA-NY), and aimed at engaging consumers across our great state in eating local (and organic, if possible) foods. The goal for this campaign, according to their website, is to educate consumers about how to make healthy and ethical food choices, cook with in-season, local (and organic) foods, while supporting local sustainable farms and food businesses. 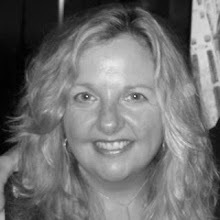 NOFA-NY's goal is to engage 5,000 people. They're offering lots of different challenge levels from one day to one month in duration, Bite-Sized, a Meal-Sized or a Feast-Sized challenge, and prizes!!! You can host a pot luck, read one of the recommended books, shop and cook with locally grown ingredients and more to satisfy the challenge.